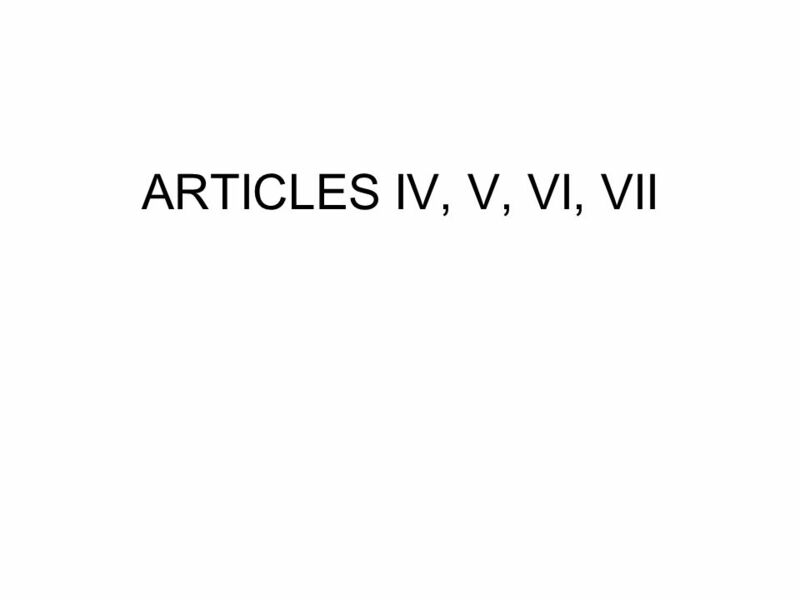 ARTICLES IV, V, VI, VII. The Citizens of each State shall be entitled to all Privileges and Immunities of Citizens in the several States. 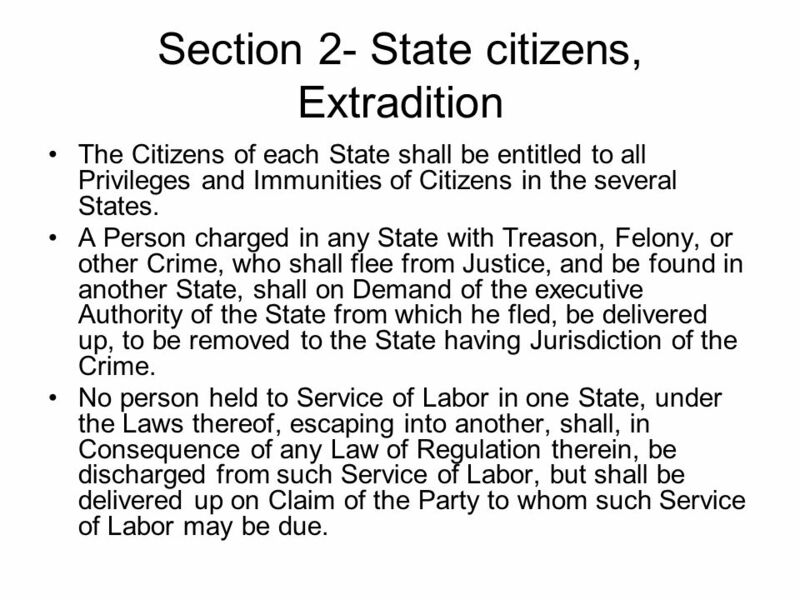 A Person charged in any State with Treason, Felony, or other Crime, who shall flee from Justice, and be found in another State, shall on Demand of the executive Authority of the State from which he fled, be delivered up, to be removed to the State having Jurisdiction of the Crime. No person held to Service of Labor in one State, under the Laws thereof, escaping into another, shall, in Consequence of any Law of Regulation therein, be discharged from such Service of Labor, but shall be delivered up on Claim of the Party to whom such Service of Labor may be due. 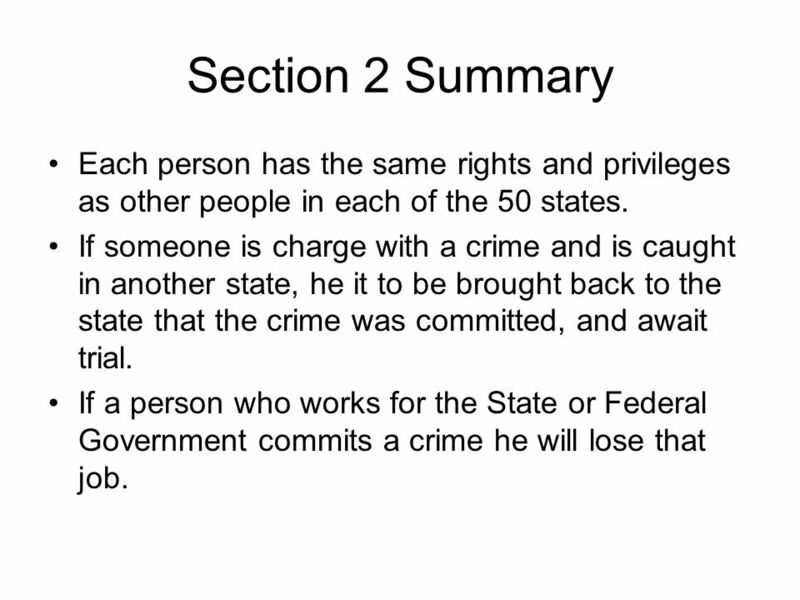 6 Section 2 Summary Each person has the same rights and privileges as other people in each of the 50 states. If someone is charge with a crime and is caught in another state, he it to be brought back to the state that the crime was committed, and await trial. If a person who works for the State or Federal Government commits a crime he will lose that job. 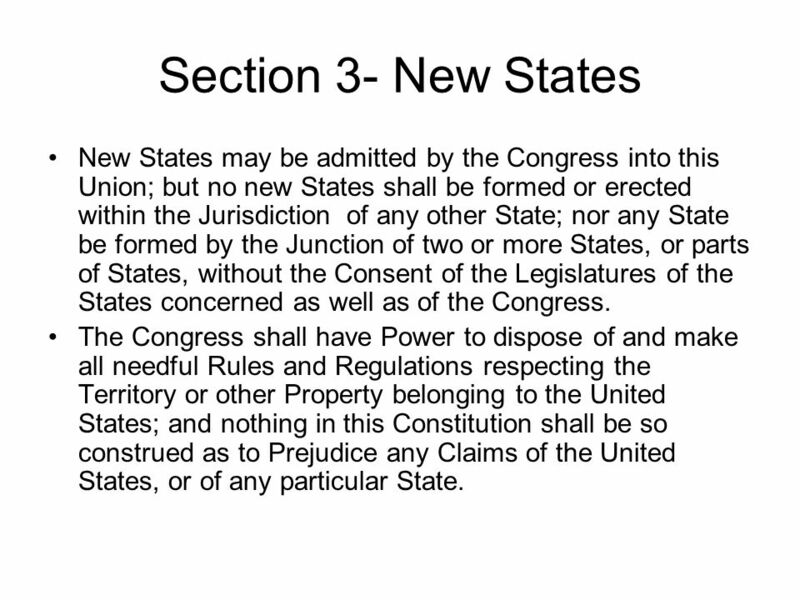 7 Section 3- New States New States may be admitted by the Congress into this Union; but no new States shall be formed or erected within the Jurisdiction of any other State; nor any State be formed by the Junction of two or more States, or parts of States, without the Consent of the Legislatures of the States concerned as well as of the Congress. The Congress shall have Power to dispose of and make all needful Rules and Regulations respecting the Territory or other Property belonging to the United States; and nothing in this Constitution shall be so construed as to Prejudice any Claims of the United States, or of any particular State. 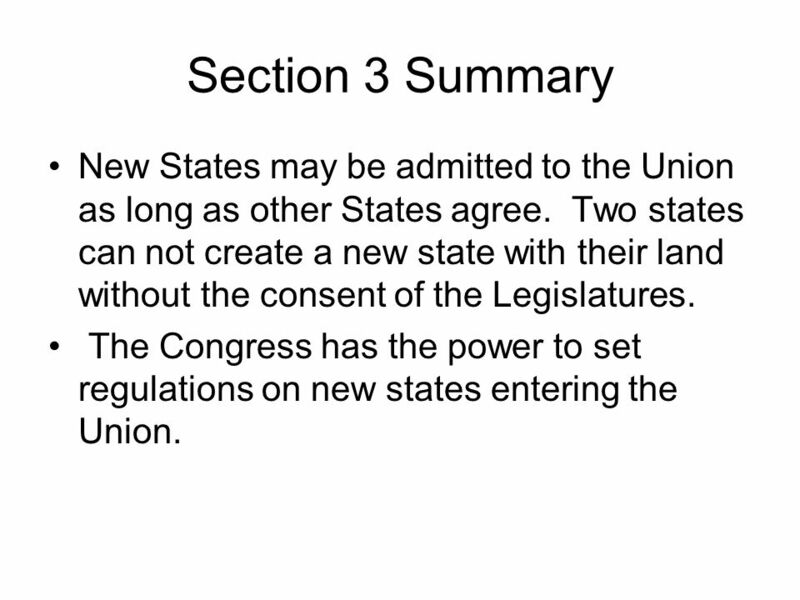 8 Section 3 Summary New States may be admitted to the Union as long as other States agree. Two states can not create a new state with their land without the consent of the Legislatures. The Congress has the power to set regulations on new states entering the Union. 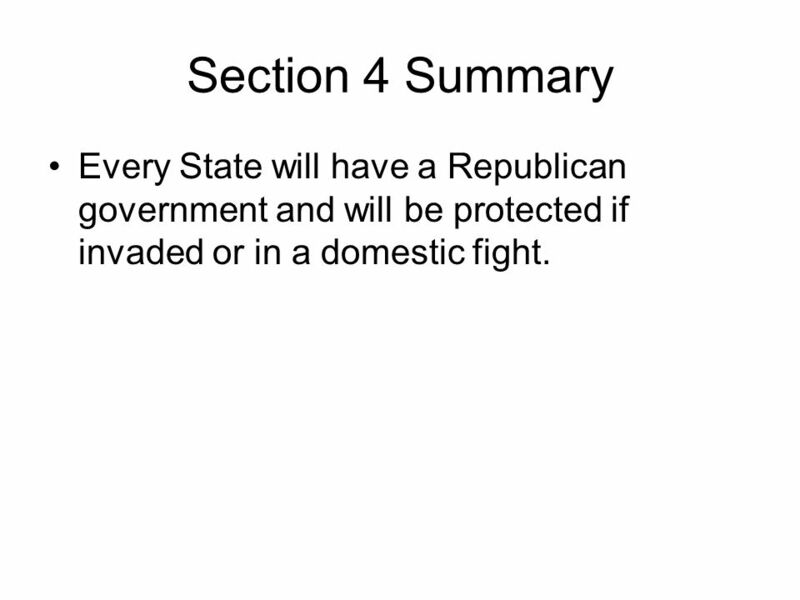 10 Section 4 Summary Every State will have a Republican government and will be protected if invaded or in a domestic fight. 12 The Amending Process The Congress, whenever two thirds of both Houses shall deem it necessary, shall propose Amendments to this Constitution, or, on the Application of the Legislatures of two thirds of the several States, shall call a Convention for proposing Amendments, which, in either Case, shall be valid to all Intents and Purposes, as part of this Constitution, when ratified by the Legislatures of three fourths of the several States, or by Conventions in three fourths thereof, as the one or the other Mode of Ratification may be proposed by the Congress; Provided that no Amendment which may be made prior to the Year One thousand eight hundred and eight shall in any Manner affect the first and fourth Clauses in the Ninth Section of the first Article; and that no State, without its Consent, shall be deprived of its equal Suffrage in the Senate. 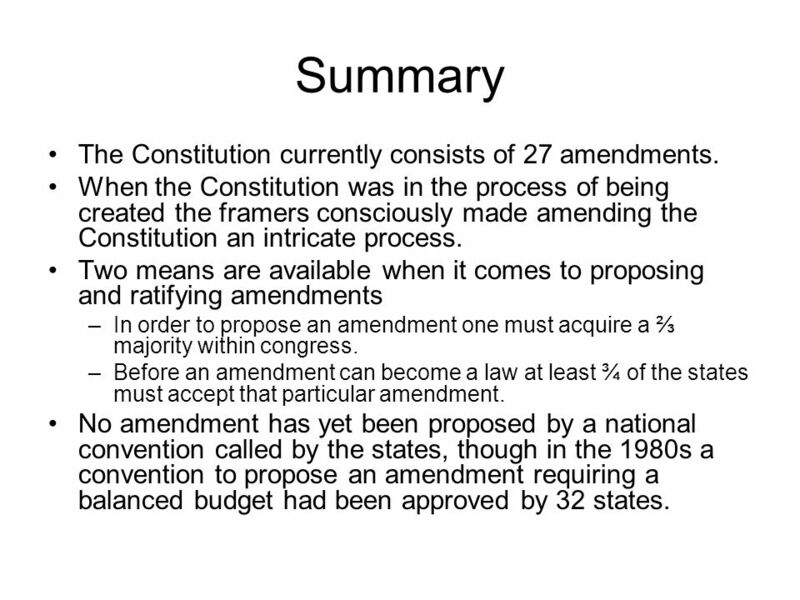 13 Summary The Constitution currently consists of 27 amendments. When the Constitution was in the process of being created the framers consciously made amending the Constitution an intricate process. 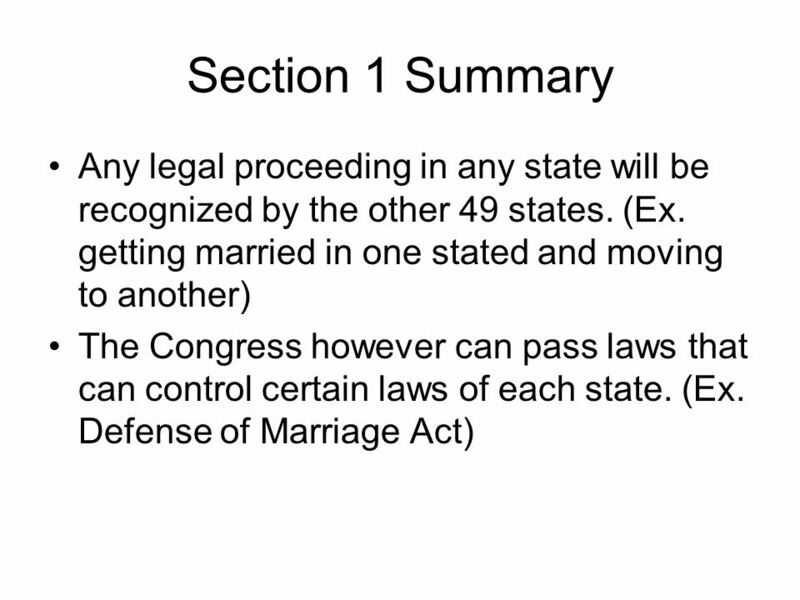 Two means are available when it comes to proposing and ratifying amendments In order to propose an amendment one must acquire a ⅔ majority within congress. 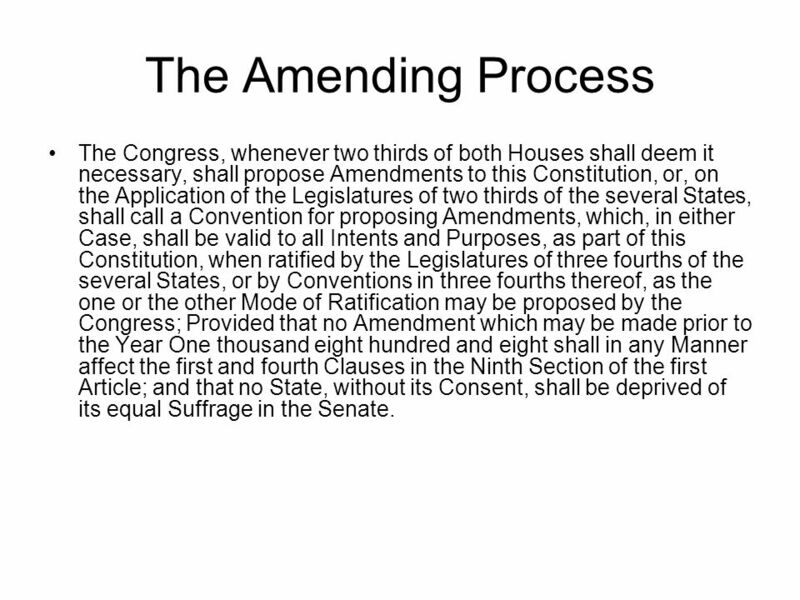 Before an amendment can become a law at least ¾ of the states must accept that particular amendment. 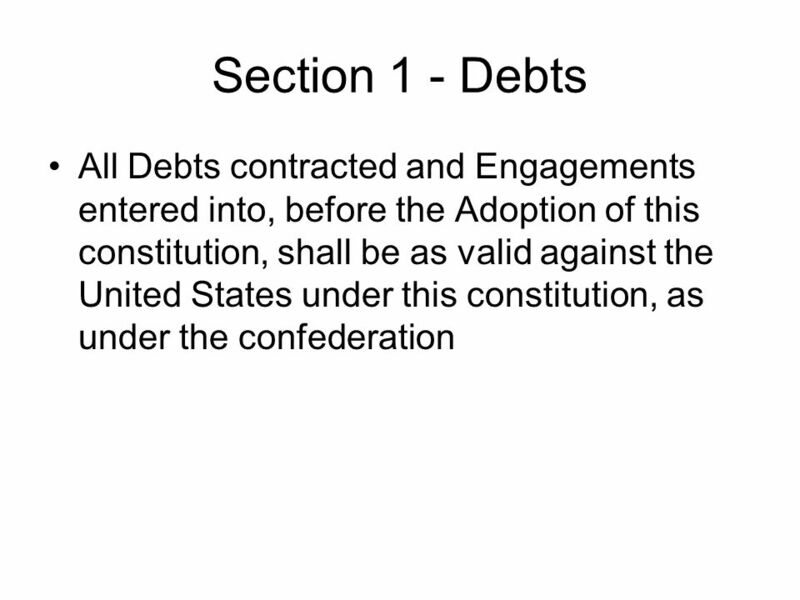 No amendment has yet been proposed by a national convention called by the states, though in the 1980s a convention to propose an amendment requiring a balanced budget had been approved by 32 states. 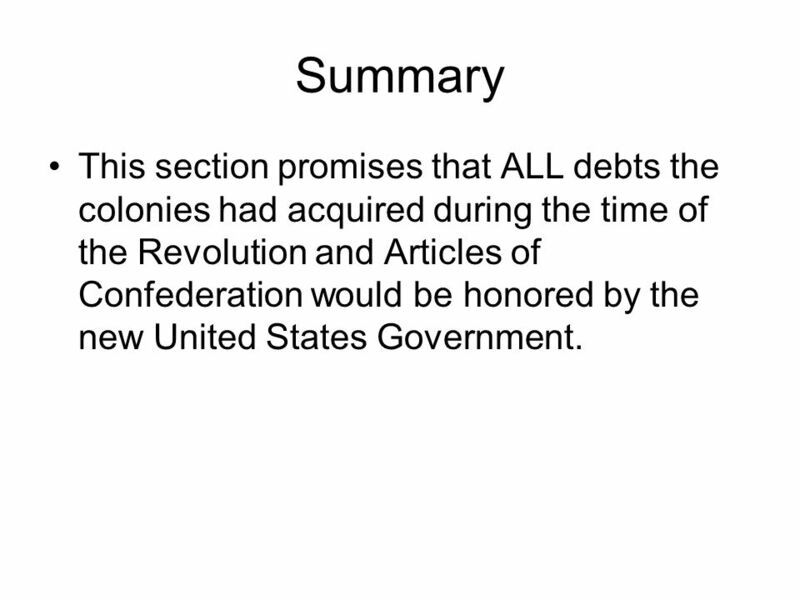 16 Summary This section promises that ALL debts the colonies had acquired during the time of the Revolution and Articles of Confederation would be honored by the new United States Government. 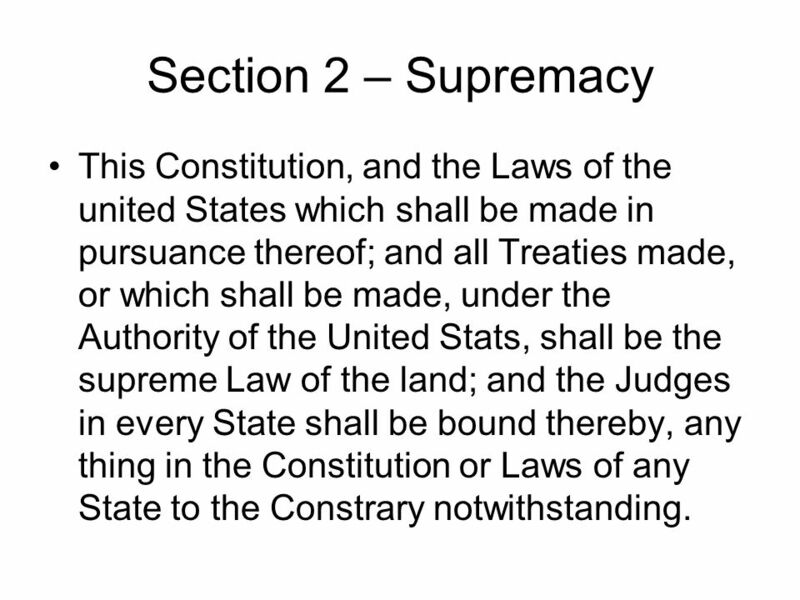 17 Section 2 – Supremacy This Constitution, and the Laws of the united States which shall be made in pursuance thereof; and all Treaties made, or which shall be made, under the Authority of the United Stats, shall be the supreme Law of the land; and the Judges in every State shall be bound thereby, any thing in the Constitution or Laws of any State to the Constrary notwithstanding. 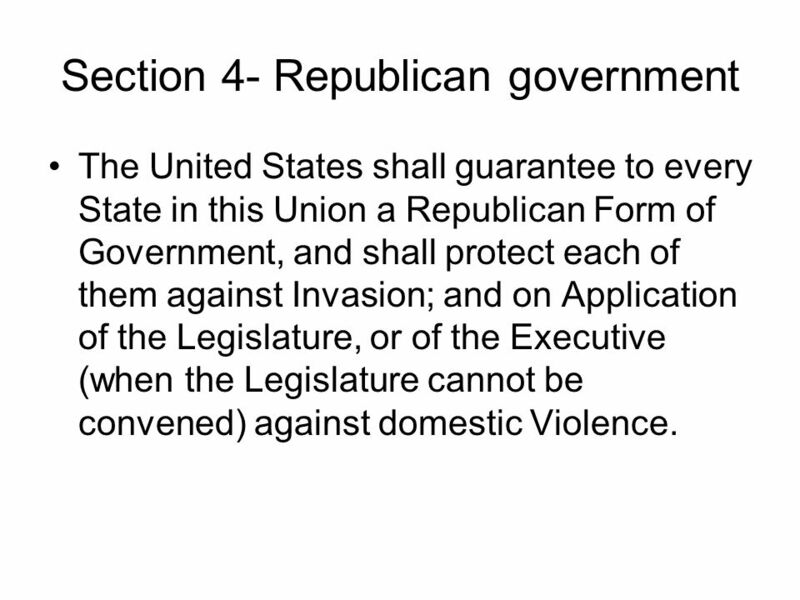 This clause recognized the constitution and federal laws as supreme when in conflict with states’ laws. Chief Justice John Marshall wrote his historic decision in McCulloch v. Maryland. 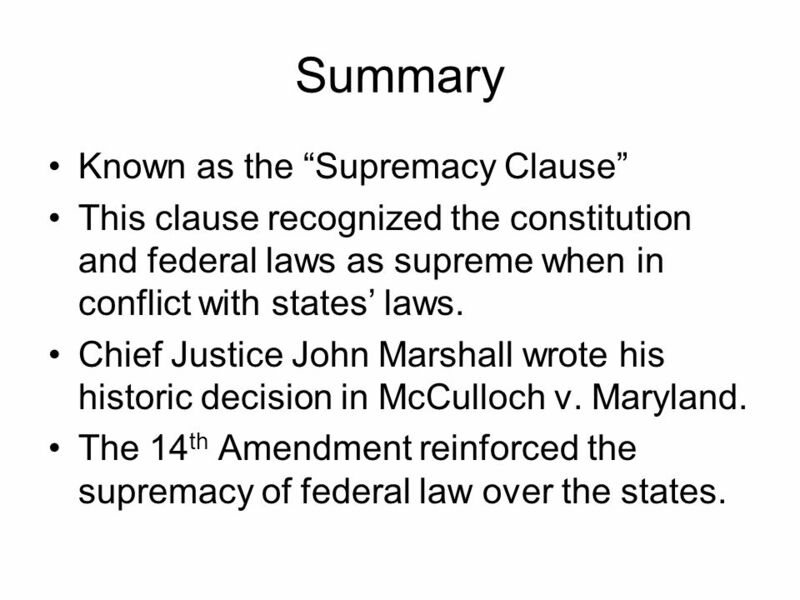 The 14th Amendment reinforced the supremacy of federal law over the states. 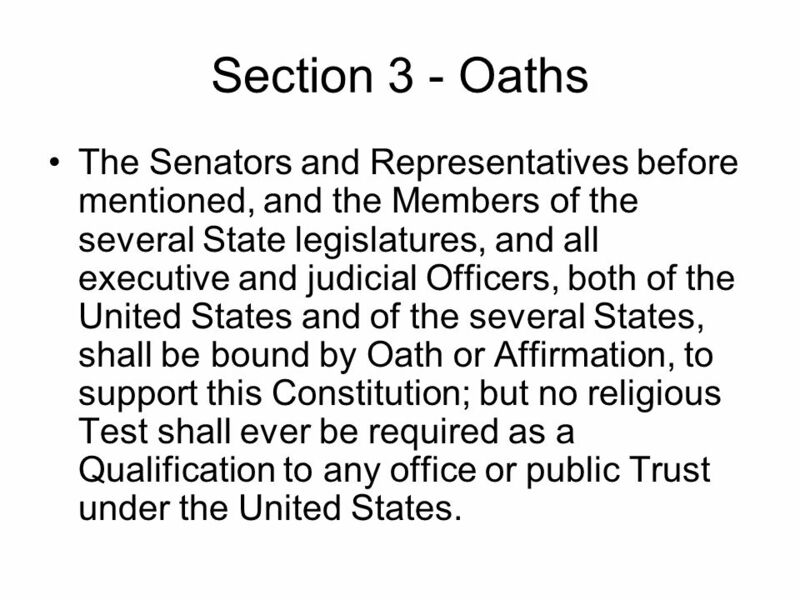 19 Section 3 - Oaths The Senators and Representatives before mentioned, and the Members of the several State legislatures, and all executive and judicial Officers, both of the United States and of the several States, shall be bound by Oath or Affirmation, to support this Constitution; but no religious Test shall ever be required as a Qualification to any office or public Trust under the United States. 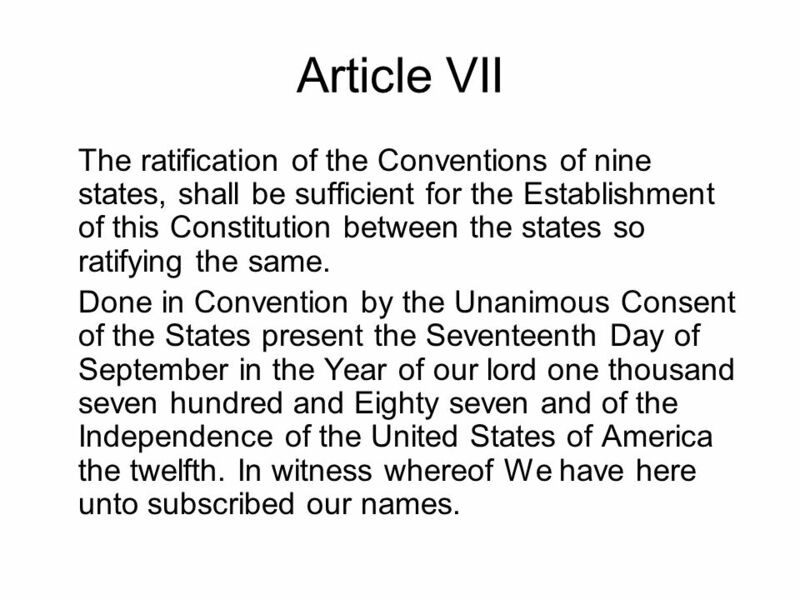 22 Article VII The ratification of the Conventions of nine states, shall be sufficient for the Establishment of this Constitution between the states so ratifying the same. Done in Convention by the Unanimous Consent of the States present the Seventeenth Day of September in the Year of our lord one thousand seven hundred and Eighty seven and of the Independence of the United States of America the twelfth. In witness whereof We have here unto subscribed our names. 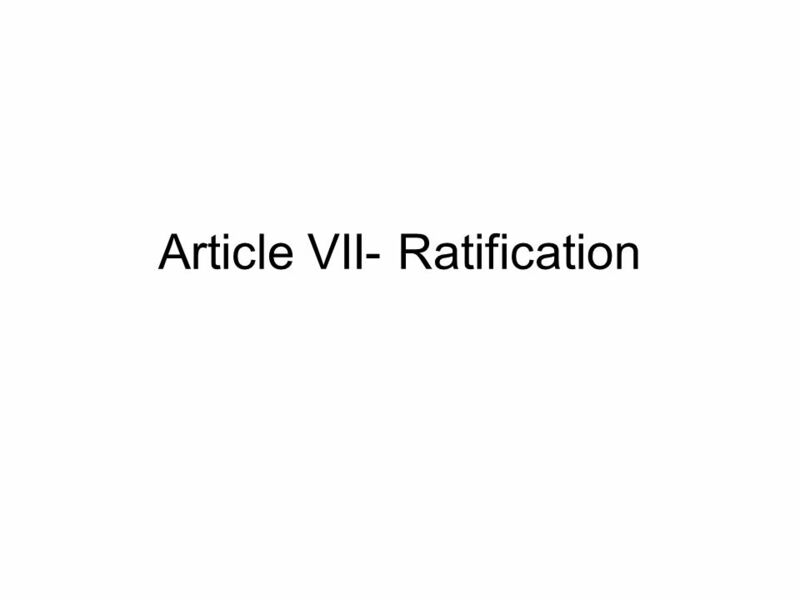 23 Summary Article VII required the approval of 9 of 13 states to ratify the constitution. 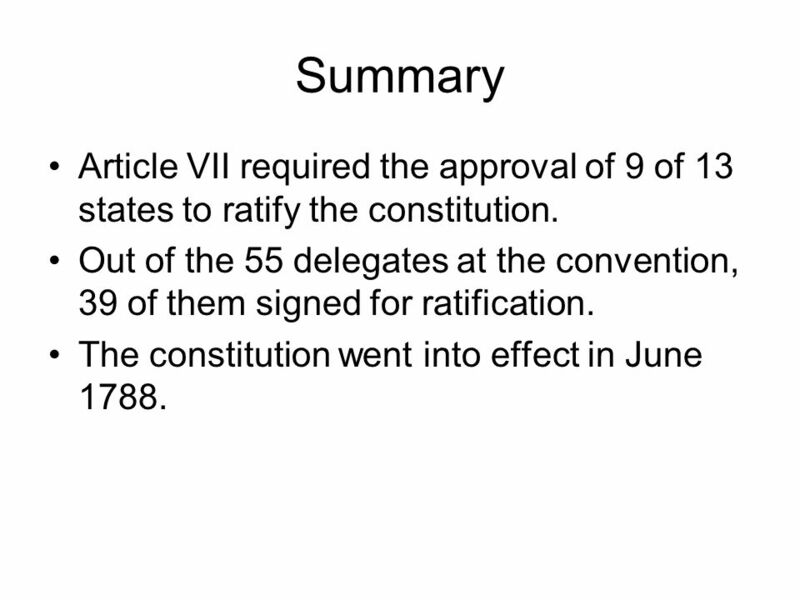 Out of the 55 delegates at the convention, 39 of them signed for ratification. The constitution went into effect in June 1788. 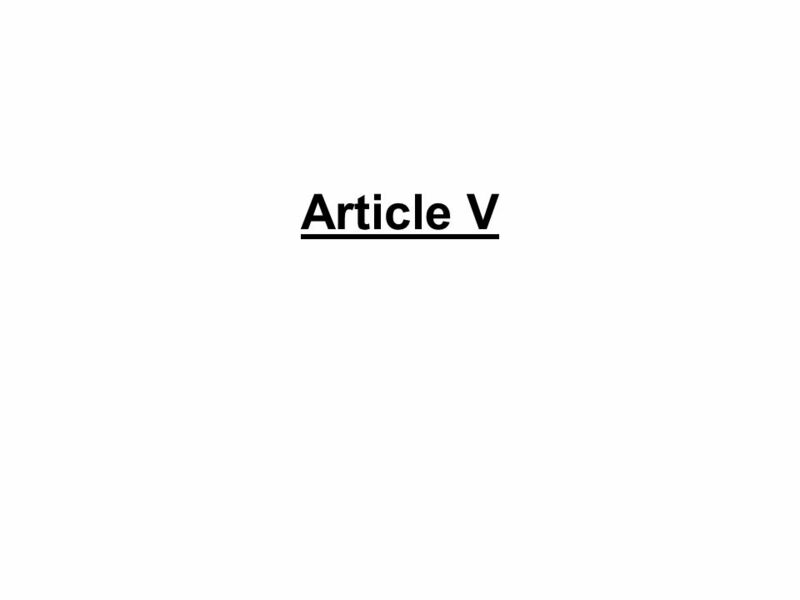 Download ppt "ARTICLES IV, V, VI, VII." 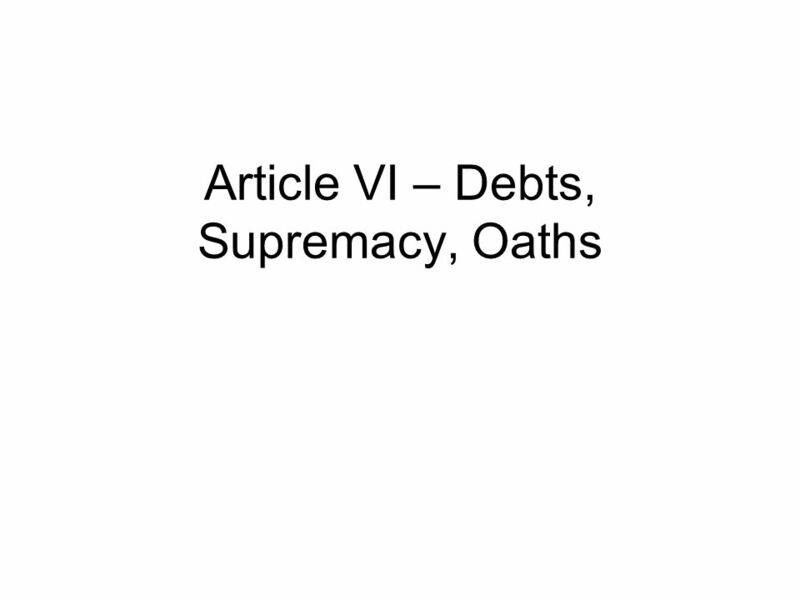 Article VI National Debt, Supremacy, and Oaths of Office By Esther Lui and Gabrielle Field. 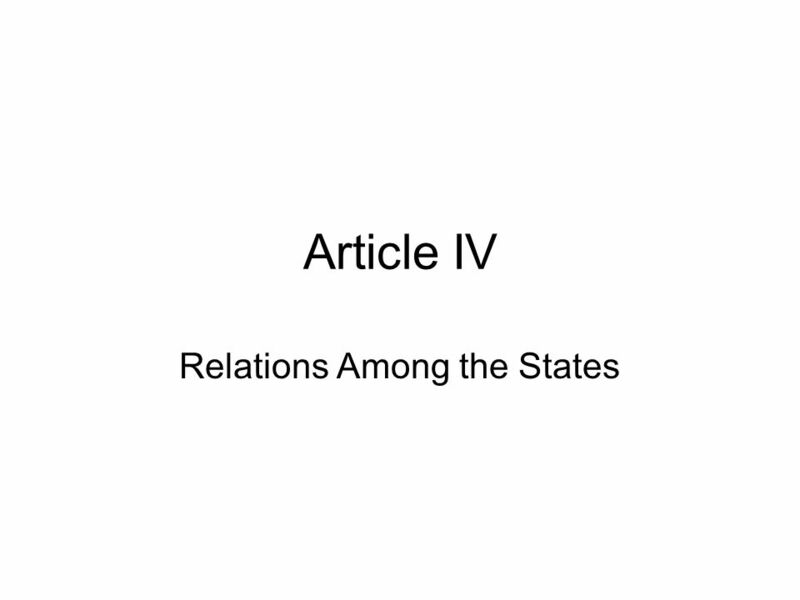 The Constitution: Articles IV-VII (4-7). 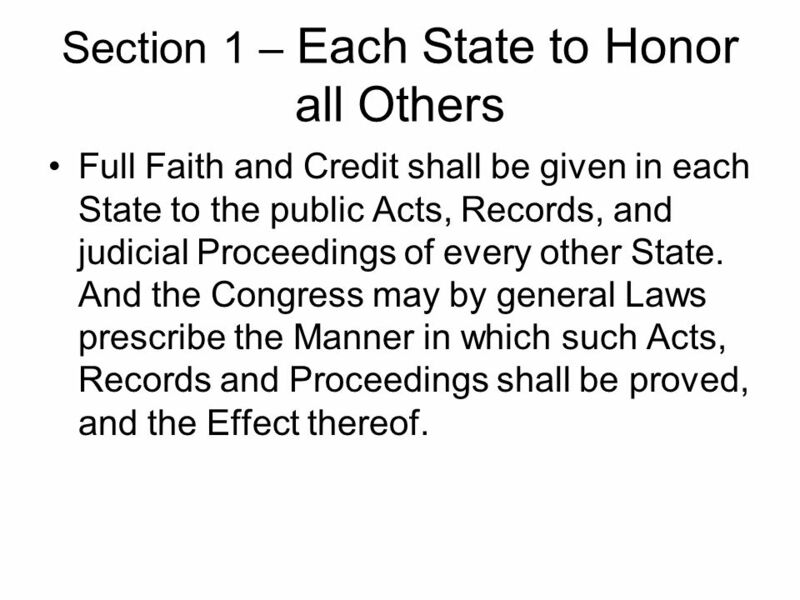 Article IV (4) Concerns the States All states will honor the laws of other states. Examples: If you get married. Constitution, Society, and Leadership Week 2 Unit 3 Anatomy of the Constitution: Articles IV-VII Christopher Dreisbach, Ph.D. Johns Hopkins University. 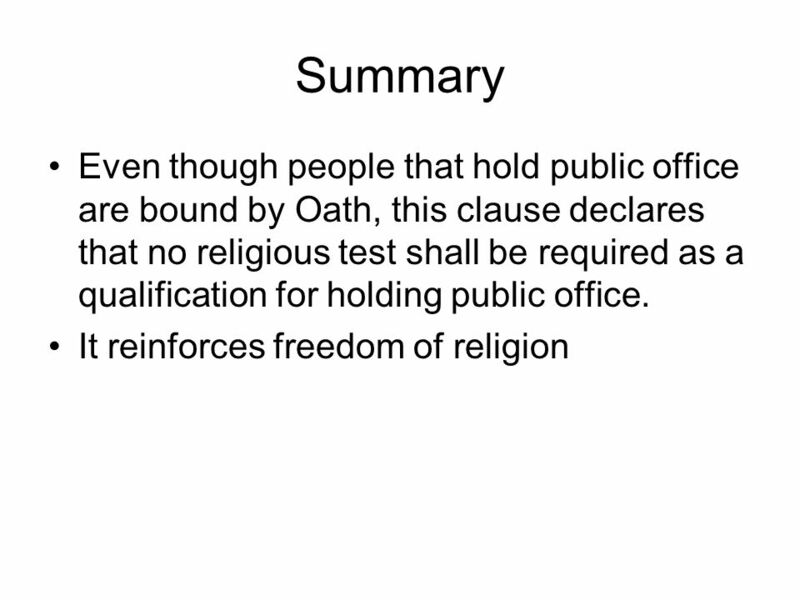 United States Constitution U.S. Government Class. Article V Amending the U.S. Constitution: What does it mean to me? How is it done? We the people of the United States, in order to form a more perfect union, establish justice, insure domestic tranquility, provide for the common. May 1781 Constitutional Convention. Shay’s Rebellion. Article I What it says: All legislative Powers herein granted shall be vested in a Congress of the United States, which shall consist of a Senate and a. Constitutional Convention. 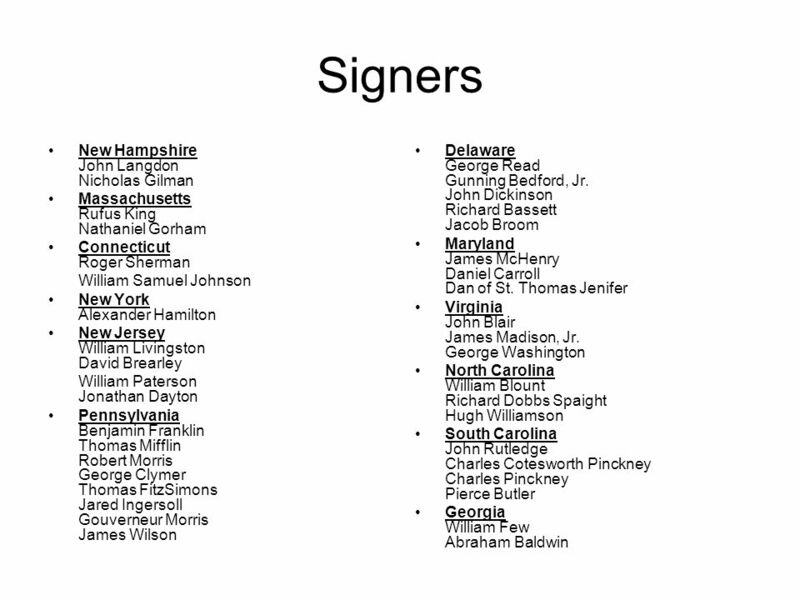 Members  55 delegates  White  Males  Statesmen, lawyers, planters. bankers, businessmen  Most under age 50.